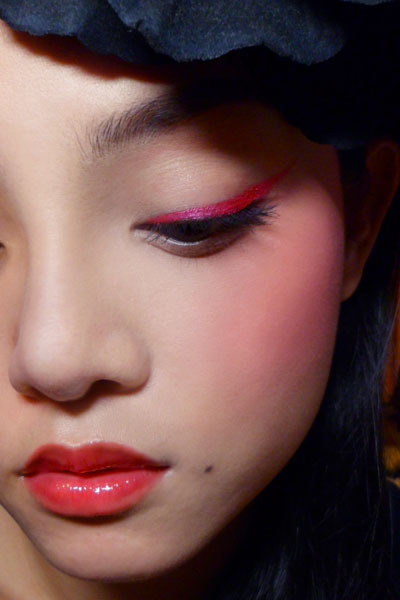 Was inspired by a recent campaign by Majolica Majorca to do a retro Chinese glam look featuring pale skin, winged liner, very intense pink cheeks and red-tinted lips. To update the look and keep it modern, an intense reddened pink liner was created using pigments and the lips were kept juicy and sheer with a clear red gloss. Step 1: Begin by applying black liner along the upper lash line, and then gently smudging it out with your finger so it's just a smoky line. This just adds nice dark definition to the base of your lashes when you apply colored liner. Step 2: I mixed some red pigments with a drop of liner sealant (use eye drops if you can't find any) and then apply it like a liner along the upper lash line from OUTSIDE-INWARDS. This makes sure you deposit the most color and thickness to the outer corners, and the line is fine on the inner corners. 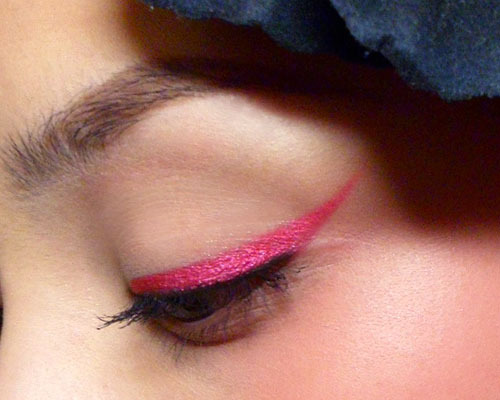 Step 3: Finish the liner by extending the ends out into dramatic wings, following the angle of your lower lid. Then apply black mascara on the upper lashes to finish. Step 4: For the cheeks, you want to use a soft brush so you don't get streaks. Then pick up some blush and run it very high up on your cheekbones. Then spread/buff upwards right under your eyes, and downwards to the hollows of your cheeks. It should be most intense right along the cheekbones. Avoid bringing the blush too far inwards toward your nose or it could look really odd. Step 5: For the lips, keep it simple since the rest of the face is pretty dramatic. Just apply a clear red gloss. Look for one that looks bright red because it will take on a slight pink cast over your lips. Extra: As a final fun step, I dotted black liner near my lip, and then set it with matte brown shadow so it looks like a real beauty mark. BHIM, is an app that has been launched in India to help the country go cashless, get this app and make your transaction easier.